Happy senior grandfather buttoning up a shirt of small grandson at home. Close up of a groom preparing for his wedding and buttoning up black fashionable suit. 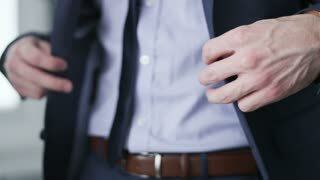 Businessman buttoning his jacket and checking hour on his watch. Man buttoning shirt closeup. Dressed man. Dressing up men's. Men hands. Man wears a jacket in early morning. Businessman adjusting sleeves.